Wednesday, January 30 was the 4th edition of the Bloomingdale day at Hoven en de Mooij. 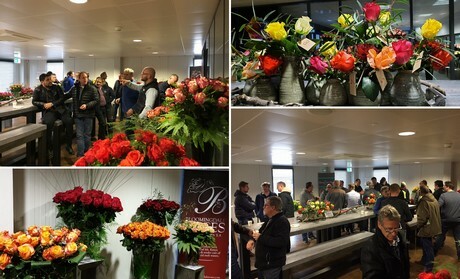 Around 150 visitors made their way to Hoven en de Mooij to admire a wonderful presentation of the varieties that the Kenyan grower Bloomingdale offers at the auction clock on a daily basis. During this day, the varieties Pink Tacazzi, Cuenca and Samanta Bridal were in the spotlight. 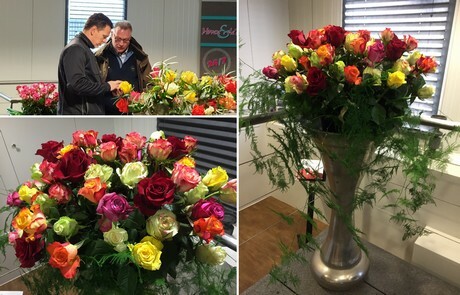 Next Friday these varieties will be introduced by Bloomingdale at Royal Flora Holland. In addition, various other varieties were presented, that for the time being only can be purchased via Hoven en de Mooij. Naturally, the remainder of the assortment could also be admired and interested parties could exchange ideas with the growers. According to true Kenyan custom, the herring cart made an appearance again, as Peter Vrouwe of Portal Flora - Hoven en de Mooij told us, "we are already looking forward to the next Bloomingdale day, which will be a lustrum." Were you not able to attend, but still curious about the presentation? This can still be admired today and tomorrow.